Why Post and Go? When is enough enough? Jersey celebrates George III. Well no, not actually King George III, but Jersey Post has decided it has to mark the third birthday of Prince George of Wales. This prolific producer of 'collectibles' (I suspect their output may rival Royal Mail's) has chosen to mark this Royal achievement not - for once - with a set of 6 stamps and a miniature sheet, but by applying an additional inscription to their Post and Go flag stamp from kiosk JE02, reports Commonwealth Stamps Opinion. And having set the precedent for George's 3rd birthday, surely this must be repeated every year (nothing special about the third, after all? ), and also for his sister - and probably his mother and father as well. Add in the birthdays of his grandfather, great-grandmother and others, and collectors of Jersey stamps may wonder whether their pennies (the set costs £4.48 plus import VAT) might be better spent on the output of a territory slightly less prolific - say the Grenadines of St Vincent! This column is my opinion only and does not offer investment advice nor criticise collectors who must, of course, spend their money on their collections however they see fit. Many would be amazed at the postal history I have spent my money on! I agree.Nothing special for a 3rd Birthday.Jersey should of thought this one through,and issued a underprint for The Battle Of The Flowers.Takes place at the beginning of August every year.The Jersey underprint would of been more relevent for the island.And also promoted tourism at the same time.Do I have a point? 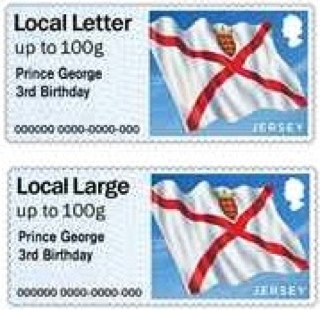 No doubt there are events of local significance to Jersey than George’s 3rd birthday, but would they be as much of a money making vehicle for Jersey Post? How many more will buy them because of the Royal connection, than just because they are Post and Go? I don't know the answer, but I doubt if it will be many locals. Look out for European collectors/dealers flying in to St Helier in droves! The Trouble with the JERSEY PHILATELIC BUREAU is that they do not offer these or other Overprints from the Island on Standing Order so Postage (£1.85) is also added to the total. It's only a problem if you really want to buy them! No doubt the usual crowd will be there in person, however they are available from the bureau. I agree with you for the domestic market, however anything related to the Royal Family is big business in a number of countries around the world. I think we all agree that these are a way of increasing their profits rather than a postal need, so will take steps to maximise their earnings from these machines. Let’s not forget that Jersey and Guernsey are allied to the Crown not the Government of the UK, so could be argued that they are extremely relevant to the island. I am sure the Germans will fly in for the Post & Go. Don't forget RM sold out of Queen's 90th FD Envelope blanks, the 1st time since I don't know when, ever?